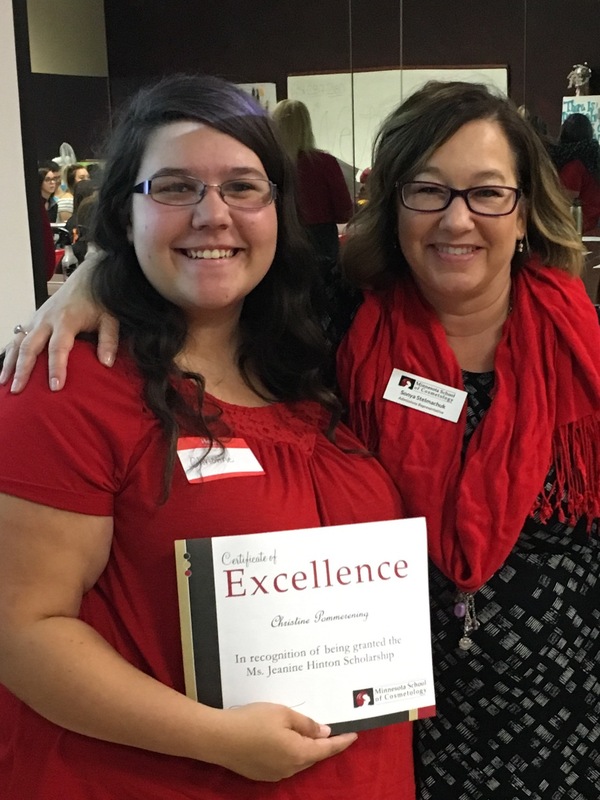 Minnesota School of Cosmetology is pleased to announce Christine Pommerening with the Ms. Jeannine Hinton Scholarship. Christine has always been intrigued by makeup and hair since she was young. Her baby dolls and Barbies were her first clients. When her grandmother gave her money for Christmas she spent it on an industry standard cosmetology doll where she practiced her skills and updo’s from YouTube Tutorials. Sadly, Christine’s mom was diagnosed with a rare lung disease and has always worked hard to ensure Christine had everything she ever needed and more. According to Christine, less than 100 people have been diagnosed with her mom’s condition and still that does not stop her from working full-time and giving back to the community. Many of their weekends are spent volunteering for various causes and it’s something that they do together since Christine was just little. “These experiences that I have had with my mother have instilled a desire and a passion to utilize my skills gained from the Minnesota School of Cosmetology to give back and help others. I look forward to a day when I can pay this great opportunity forward by offering up my services at least one day a year to those who are unable to afford a haircut for a job interview or a full makeup application for their senior portraits,” said Christine. Congratulations Christine! We are excited to have such an inspiring student start with us and we know you will do great things will your education! What is the Miss Jeanine Hinton Scholarship? 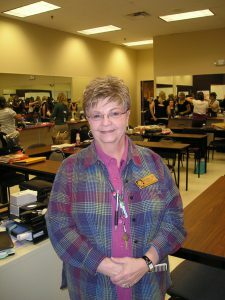 Ms. Jeanine Hinton was a Minnesota School of Cosmetology-Woodbury Basic’s instructor for 23 years. She devoted 23 years of her life to teaching, mentoring and coaching Minnesota School of Cosmetology students, not only technical skills but also life skills. She was passionate about seeing Minnesota School of Cosmetology students grow to become successful Cosmetologists and beauty industry leaders. This annual scholarship is her way of continuing to support our future of beauty industry professionals. To apply, applicants submitted an essay sharing their story, including why they want to be a professional in the beauty industry, what inspired them to choose cosmetology as their career field and their long-term goals in the industry. As an added requirement to set the recipient up for success, upon starting school they must maintain 85 percent attendance or higher. Minnesota School of Cosmetology in Woodbury is pleased to announce our very first winner of the Jeanine Hinton Scholarship! Congratulations to Brittany Thomas! Admissions representative Sonya awarding the scholarship to Brittany. Brittany will be a day cosmetology student starting August 8, 2016. Brittany will be receiving $1,000 from the Jeanine Hinton Scholarship Foundation. Minnesota School of Cosmetology is matching the scholarship for a total of $2,000. All funds cover educational expenses or will be used to reduce the student’s loans. Miss Jeanine Hinton was a Minnesota School of Cosmetology-Woodbury Basic’s instructor for 22 years. She devoted 22 years of her life to teaching, mentoring and coaching Minnesota School of Cosmetology students, not only technical skills but also life skills. She was passionate about seeing Minnesota School of Cosmetology students grow to become successful Cosmetologists and beauty industry leaders. This annual scholarship is her way of continuing to support our future of beauty industry professionals. To apply, applicants submitted an essay sharing their story, including why they want to be a professional in the beauty industry, what inspired them to choose cosmetology as their career field and their long-term goals in the industry. As an added requirement to set the recipient up for success, upon starting school they must maintain 85 percent attendance or higher. There will also be a Jeanine Hinton Scholarship awarded to a student of the Sept. 19, 2016 class at Minnesota School of Cosmetology-Woodbury. Recently, 10 students at Minnesota School of Cosmetology (MSC) in Woodbury enjoyed doing haircuts, hairstyles, and manicures for a group of adults with disabilities. The clients are part of BRIDGE, a non-profit organization in Hudson, Wisconsin providing community-based life skills training, employment services and social and recreational programs for youth and adults with disabilities. MSC Student Erin Riley was very touched by the kindness and appreciation her client showed while having her service done. Erin said it made her week to pamper such a sweet and considerate lady who rarely gets pampered at a salon. Jill Hilliard, a volunteer at BRIDGE who helped organize the day of beauty, was overjoyed by the kindness from the MSC staff and students. MSC students and staff members were happy to brighten the day for this fantastic group of caring and hardworking adults! To learn more about the cosmetology training and services offered at Minnesota School of Cosmetology, call 877-541-8777. Each year, the Minneapolis based Joe Francis Haircare Scholarship Foundation awards 25 students across the United States $1,200 scholarships toward tuition for cosmetology education. One of our Minnesota School of Cosmetology-Woodbury students, Faith Hilliard, was one of the 25 students who was awarded this amazing scholarship. The Joe Francis Haircare Scholarship Foundation’s mission is to help deserving students receive financial assistance for the professional training necessary to build successful, long-term careers in the cosmetology industry. The foundation was founded to honor the life, work and memory of Joe Francis who was born into poverty but achieved worldwide cosmetology and business success through sacrifice, hard work and determination. Admissions representatives at Minnesota School of Cosmetology inform potential students of a variety of scholarships such as this one. To apply for the Joe Francis Haircare Scholarship, cosmetology students are required to fill out the application, write a heartfelt, personal essay and also submit two letters of recommendation. Since its inception 19 years ago, the Joe Francis Haircare Scholarship Foundation is approaching giving half a million dollars in scholarships. 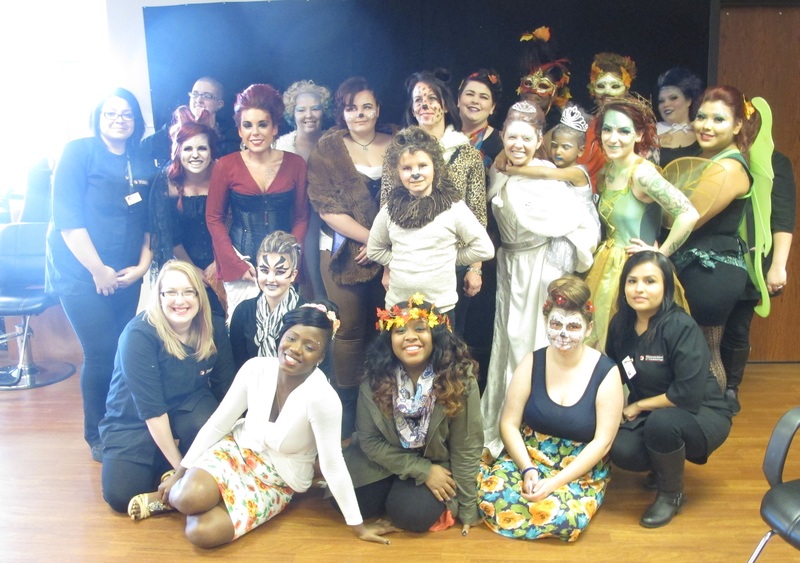 Minnesota School of Cosmetology hosted their 2nd annual Fall Fashion Show. This year’s theme was Seasons. We set our fashion shows up as a reverse career fair. Allowing for our students to create inspiration boards with their before and after photos as well as what inspired their overall look. We encourage our students to have resumes available to hand out to the industry professionals that would be attending the show. After the show we gave the Salons and Industry Professionals the opportunity to meet our students and talk with them about how they completed their looks and their career aspirations. We had our students choose the groups they worked with, as well as choosing a season they would like to be inspired by. Our students chose their own music for the show as well. We encouraged students to have a few different looks for their season. The students had been preparing for the show for weeks in advance and all their time and hard work really showed through their looks. Thank you to all the family and friends who were able to come out to the shows and for the continued support you give our students daily. They wouldn’t be where they are at today without you! We would like to give a special thanks to all the Salons and Industry Professionals that attended our Fall Fashion Show! As well as to European Wax Center who created a “Best Brow” category! Thank you for supporting our students! You can check all the looks from the fashion show on our facebook page! That is the advice from Minnesota School of Cosmetology student, Kaboa Yang. 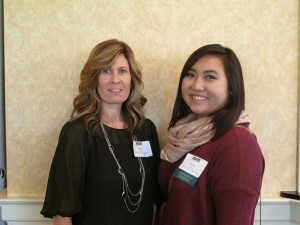 She is one of 24 adult learners awarded the TwinWest Chamber of Commerce’s Career Path Scholarship during a luncheon on October 6, 2015. The scholarship rewards adult learners who are pursuing career education, particularly those seeking vocational or technical skills. The scholarship creates a win-win situation by helping those who are motivated and passionate achieve the training they need, which in turn helps boost the skilled workforce for local companies. Kaboa definitely has the motivation and passion. In fact, she has known since middle school that she wanted to pursue a career in cosmetology, but says nerves and cultural pressure side-tracked her for a little while. “The Hmong community I grew up in does not look highly on cosmetology as a career,” Koboa says, “I not only want to change that perception, I want to show them how much you can do with a cosmetology diploma and the career options you can build off of it.” It was that passion and drive that impressed to scholarship selection committee. Kaboa toured Minnesota School of Cosmetology when she was a freshman at Patrick Henry High School and says she knew then she wanted to come here. “My cousin and aunt both went here and loved it. When I saw pictures of them doing hair, I knew I had to be here too,” she says. But she adds high school counselors, along with her family, really pushed the idea of a traditional college. Feeling pressured and nervous, Kaboa followed their advice and enrolled in community college after high school with the intention of pursuing a degree in business management. But that passion for cosmetology kept tugging at her, and she quickly realized she could not give up on her dream. Kaboa began the cosmetology program at MSC in March of 2015 and has not looked back since. “I have gained so much confidence, and unlike many students at a traditional college, I know what I want to do when I graduate,” she says. “By starting here, I am already on a career path.” Kaboa’s real love is makeup and she hopes to use that passion to help others feel great about themselves in the future. Kaboa says growing up in a family of eleven, money was always tight. With this $500 scholarship and a matching GEN Scholarship, she says she will be able to pay off her loans faster and focus more on her new career. 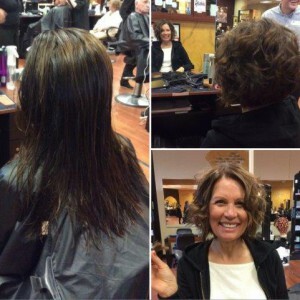 MSC Student Gives Michele Bachmann a New Style and New Look! Michele Bachmann, former politician and member of the U.S. House of Representatives, visited Minnesota School of Cosmetology this week and left with a whole new look and a very big smile! Ms. Bachmann, who represented Minnesota’s 6th congressional district from 2007-2015, has been visiting Minnesota School of Cosmetology in Woodbury for five years. She is one of our regular clients who continues to give back to higher education and student learning. At Minnesota School of Cosmetology our students study the art of hair, skin and nails for 10-12 months to gain the requirements necessary to become a licensed cosmetologist. One of the requirements is to perform salon services on clients. In order to advance in their technical skills and become savvy cosmetologists, they need to have people in the community who are willing to come to the school for hair colors, perms, relaxers, haircuts, manicures, pedicures, makeup applications and facials. Ms. Bachmann has been providing that one-on-one ability for our students to hone their skills by supporting them with regular visits. This week, Ms. Bachmann took a big leap. She came in for her typical 1-2 inch trim but changed her mind and decided to spice things up a bit. Instead she took off nearly 12 inches! Ms. Bachmann shared with her stylist/MSC student, Kim Castro that she has had long hair for 19 years and she was ready for a change. Castro also shared, “Ms. Bachmann was very pleasant, she was interacting with me the whole time and we had a very enjoyable conversations. She shared with me that she’s been coming here for five years and the reason she continues to keep returning is because she likes it here and enjoys meeting all the different students”. To learn more about our program or the services we provide to the public, visit msccollege.edu. Many Minnesota School of Cosmetology (MSC) students lead busy lives, but Rachelle (Shelly) Blackstone stands out. 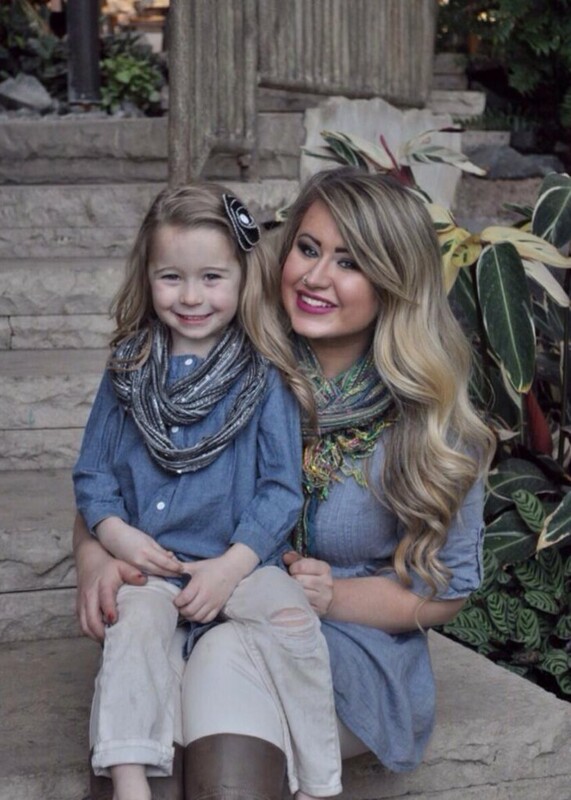 Not only does she attend school full time, but she has recently branded her own makeup line and opened her own salon, all on top of being a mom. Before deciding to pursue her passion for cosmetology, Shelly earned an associate degree at a community college and worked in the medical field for six years. Shelly is such a hard worker and has such a positive attitude that many of her classmates and instructors don’t know she runs her own businesses in addition to going to school. Her makeup line, named Eve after her 5-year-old daughter Evelyn, was officially launched in January 2015, five months after she began classes at MSC. Her salon, La Croix Salon and Spa, opened in Stillwater, Minn., on April 1, and Shelly says she still can’t believe it. Students look up to her and educators admire her initiative, but Shelly says it’s the support from her fellow classmates and her instructors that keeps her going. Shelly says she appreciates the variety of the instructors and that they are all creative, genuinely care about her success and make her education personal. She is set to graduate in September of 2015, and she doesn’t plan to stop achieving her goals. 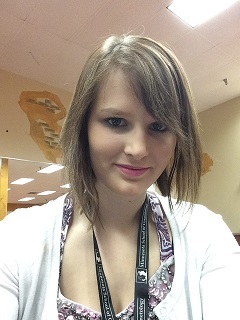 Shelly says she hopes to help other MSC students reach their goals, too. Visit www.msccollege.edu to learn more. Minnesota School of Cosmetology student Jennifer Hawes is a mother of four kids, who says she’s finally found something she’s good at – and a career path she loves. Jennifer says she likes the environment at Minnesota School of Cosmetology and that the instructors have helped her achieve her goals. Jennifer says the use of iPad™ technology enhances her education, as well as the salon experience for her clients. With the encouraging instructors and hands-on technology, Jennifer says she is well-prepped for a future in the beauty industry. Heather Melton always knew she wanted to be a cosmetologist. 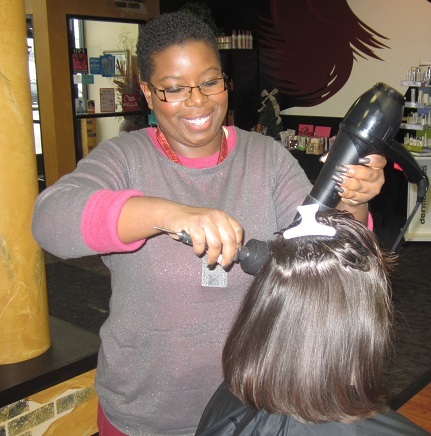 As a student at Minnesota School of Cosmetology, she enjoys the daily interaction with clients. The experience she gets from working with real clients and practicing the skills she learns in the classroom is something Heather appreciates about MSC. “Minnesota School of Cosmetology is hands-on right away, so instead of just learning from the book, I get to do everything right off the bat,” Heather says. That hands-on experience is what Heather says has her ready for a career in the field. “They prepare you for the nitty-gritty and also for all the technical work that you’ll be doing on a day-to-day basis,” she says. One of the things Heather likes best about the program at MSC is the variety of things she can do with her education. “They give so many different job opportunities and ideas out there, it’s not just a one track type of school,” she says.